Get a natural flawless looking tan that dries in seconds with help from Bondi Liquid Gold Sands Self Tanning Foam. Bondi Sands Reusable Exfoliating Mitt with dual action sides exfoliates dead skin cells to help prepare your skin for a streak free tan. Bondi Sands Self Tanning Mitt is a specially designed mitt for applying self tanning products to achieve a more professional looking tan. Streak-free and even application that is so pleasing to the eye. 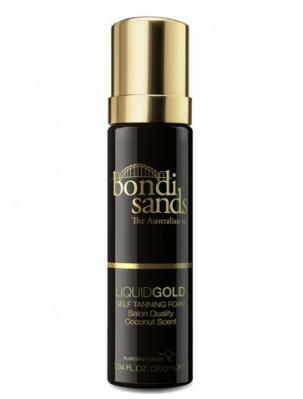 Bondi Sands Liquid Gold Self Tanning Foam is a great help in giving you that natural flawless looking tan. This hydrating self-tanning foam will develop into a golden tan that is touch dry in seconds. Pump foam applicator firmly and apply Bondi Sands Self Tanning Foam liberally to a Bondi Sands Self Tanning Mitt before using a long sweeping motion to legs, arms and body. Use remaining residue on tanning mitt for face, elbows and knees. Wait until touch dry for dressing. No shower necessary. Now would be great time to take an after photo and #bondisands. For a deeper tan reapply 30 minutes after application. Use only as directed. This product is for external use only. Keep out of reach of children. Babies 6 months old and below should be kept out of the sun. Keep away from the eye area. Ensure that you keep away from factors that may dry your skin such as salt water, chlorinated water or even showering with very hot water. If itching, redness or irritation is experienced, discontinue use. Here is a review and demo we found on youtube.